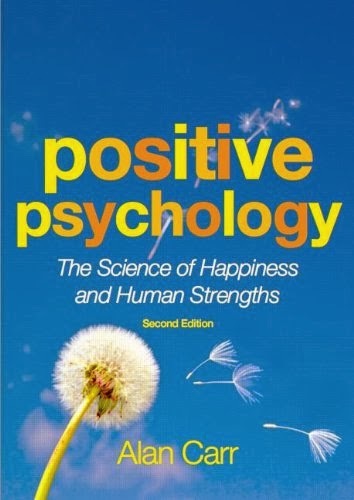 My interest in happiness and well being drove me to understand the constituents of positive psychology (PP) in deep. I met C R Snyder in 2004 and we discussed about his Hope Theory and Pathways. When I read his text on PP (coauthored with Shane Lopez and published by Sage), I got little more interested in PP and that introduced me to Alan Carr and his work and that is how I landed up reading this rich, simple, systematic and superb text. For a student of psychology PP is an interesting area which has evolved in the times of work stress, work life balance, organizational pressures and competition and related developing issues which have assumed more importance in the wake of globalisation and focus on mobility. Though Snyder's text was an exhaustive and illustrative one, Carr's work is relatively brief concentrating on the development of concept of different constituents of PP. The development of psychology from a science of managing disability to clinical solutions has added a new vista as to deal with human strengths and concentrate on individual happiness and well being. This is the basic premise of PP. The book is divided in 9 chapters - Happiness, Flow, Hope and Optimism, Emotional Intelligence, Giftedness, creativity & wisdom, Positive traits and motives, Positive self, Positive relationships, and Positive change. These are the constituents or basic elements of PP and Alan has elaborated each one of them brilliantly supported with relevant research citations and related literature. Research tools and instruments are discussed with their application and derived findings to strengthen the defense and develop a stronger concept. Researchers and authors like Edward Diener, David Watson, Martin Saligman, Charles Synder, Christopher Peterson, Michael Argyle, Mihaly Csikszentmihalyi, Daniel Kahneman, David Myers, etc have contributed extensively in the development of different aspects of PP and their measurement. Their contributions have been cited wherever appropriate. Each chapter begins with learning objectives and ends with implications, controversies, summary, questions, further reading, measures for use and glossary. The writing of the text is very simple and easy to understand. Though this text was written around ten years before, it provides strong foundation for this emerging field of knowledge in the area of psychology. Alan's contribution to the cause of expanding PP shall go a long way in its development and academic sustainability. For a beginner and entry level psychology student this shall immensely help. Professor at Department of Commerce, Delhi School of Economics, University of Delhi, Delhi.